William Alexander "Bud" Abbott (October 2, 1897 – April 24, 1974) was an American actor, best known for his film comedy double act, as straight man to Lou Costello. Born into a show business family, Abbott worked in the box office of several theatres, before becoming a comedian/producer of burlesque shows on Broadway, where he allowed Costello to appear with him when his own partner was off ill. They formally teamed up in 1935. Their signature routine, "Who's on First? ", was carried through to radio and then to their film debut One Night in the Tropics (1940) and Buck Privates (1941). The duo would go on to make 36 films. During World War II, they were among the most popular entertainers in the world, and sold $85 million in war bonds. Abbott and Costello launched their own long-running radio show in 1942, and then a live TV show. But by 1955, they were felt to be over-exposed, their film contract was terminated, and the partnership split soon afterwards. Costello died in 1959, and Abbott’s attempts to work with new partners did not succeed. In his last years, he was troubled with serious tax problems and heavy drinking to stave off epileptic seizures. Groucho Marx declared Abbott to be the best straight man in the comedy business. Abbott was born in Asbury Park, New Jersey on October 2, 1897, into a show business family. His parents, Rae Fisher and Harry Abbott, had worked for the Barnum and Bailey Circus. Several years after the family relocated to Brooklyn, Abbott dropped out of grammar school and began working summers with his father at Dreamland Park on Coney Island. When he was 15, Abbott signed on as a cabin boy on a Norwegian steamer but was soon forced to shovel coal. He would work his way back to the United States after one year. His father was a longtime advance man for the Columbia Burlesque Wheel, and he installed Bud in the box office of the Casino Theater in Brooklyn. Bud spent the next few years in burlesque box offices. In 1918, working in Washington, D.C., he met and married Jenny Mae Pratt, a burlesque dancer, and comedian who performed as Betty Smith. They remained together until his death 55 years later. In 1923 Abbott produced a cut-rate vaudeville tab show called Broadway Flashes, which toured on the Gus Sun circuit. Abbott began performing as a straight man in the show when he could no longer afford to pay one. He continued producing and performing in burlesque shows on the Mutual Burlesque wheel, and as his reputation grew, he began working with veteran comedians like Harry Steppe and Harry Evanson. Abbott suffered from epilepsy starting from about 1926. In 1964, he suffered the first in a series of strokes. Abbott crossed paths with Lou Costello in burlesque a few times in the early 1930s when Abbott was producing and performing in Minsky's Burlesque shows and Costello was a rising comic. They first worked together in stock burlesque in 1935 at the Eltinge Theatre on 42nd Street, after an illness sidelined Costello's regular partner. They formally teamed up in 1936, and went on to perform together in burlesque, vaudeville, minstrel shows, and stage shows. In 1938, they received national exposure as regulars on the Kate Smith Hour radio show, which led to roles in a Broadway musical, The Streets of Paris. In 1940, Universal signed the team for their first film, One Night in the Tropics. Despite having minor roles, Abbott and Costello stole the film with several classic routines, including an abbreviated version of "Who's On First?" During World War II, Abbott and Costello were among the most popular and highest-paid stars in the world. Between 1940 and 1956 they made 36 films and earned a percentage of the profits on each. They had their own radio program (The Abbott and Costello Show) throughout the 1940s, first on NBC from 1942 to 1947, and from 1947 to 1949 on ABC. In the 1950s, they introduced their comedy to live television on The Colgate Comedy Hour, and launched their own half-hour series, The Abbott and Costello Show. Abbott was very supportive of his relatives. Norman and Betty Abbott, the children of Bud's older sister, Olive, started their careers working behind the scenes on Abbott and Costello films. Betty became Blake Edwards' longtime script supervisor, and Norman directed episodes of many television series, including Leave It to Beaver, The Jack Benny Program, Sanford and Son and Welcome Back, Kotter. Relations between Abbott and Costello were strained by egos and salary disputes. In their burlesque days, they split their earnings 60%–40%, favoring Abbott, because the straight man was always viewed as the more valuable member of the team. This was eventually changed to 50%–50%, but after a year in Hollywood, Costello insisted on a 60%–40% split in his favor, and it remained so for the remainder of their careers. Costello also demanded that the team be renamed "Costello and Abbott", but this was rejected by Universal Studios, resulting in a "permanent chill" between the two partners, according to Lou's daughter Chris Costello in her biography Lou's on First. Their relationship was further strained by Abbott's alcohol abuse, a habit motivated by his desire to stave off epileptic seizures. The team's popularity waned in the 1950s, and they were bedeviled by tax issues; the IRS demanded heavy back taxes, forcing the partners (both of whom had been free spenders and serious gamblers) to sell most of their assets, including the rights to many of their films. Universal dropped their contract after 14 years in 1955. In late 1956, Lou was the subject of the Ralph Edwards-produced TV show, “This Is Your Life”, and Bud was invited. He expressed sadness that they ever had a feud. Abbott and Costello split in 1957. Lou Costello died on March 3, 1959. Abbott then planned to team up with Eddie Foy Jr. In 1960, Abbott began performing with a new partner, Candy Candido, to good reviews. But Abbott called it quits, remarking that "No one could ever live up to Lou." The following year, Abbott performed in a dramatic television episode of General Electric Theater titled "The Joke's on Me". On December 7, 1962, in Hollywood, a gray-haired Abbott, holding a cane, was interviewed by Jack Linkletter. They reprised “Who’s on First?”. In 1966, Bud was filmed alongside Elvis Presley and Barbara Stanwyck, at a charity event promotion. A year later, Abbott provided his own voice for the Hanna-Barbera animated series The Abbott and Costello Cartoon Show, with Stan Irwin providing the voice of Lou Costello. Bud and Betty Abbott were married for 55 years. The couple adopted two children: Bud Jr. in 1942 and Vickie in 1949. Bud Jr. died on January 19, 1997, at age 57. Abbott has three stars on the Hollywood Walk of Fame: the radio star is located at 6333 Hollywood Boulevard, the motion pictures star is located at 1611 Vine Street, and the television star is located at 6740 Hollywood Boulevard. Abbott died of cancer at age 76 on April 24, 1974, at his home in Woodland Hills, Los Angeles. He was cremated and his ashes scattered in the Pacific Ocean. His widow, Betty, died on September 12, 1981. When Groucho Marx was asked about Abbott shortly after his death, his response was that Abbott was "the greatest straight man ever." Abbott and Costello are among the few non-baseball personnel to be memorialized in the Baseball Hall of Fame, although they are not inductees of the Hall itself. A plaque and a gold record of the "Who's On First?" sketch have been on permanent display there since 1956, and the routine runs on an endless video loop in the exhibit area. Abbott and Costello each have three stars on the Hollywood Walk of Fame for their work in radio, television and motion pictures. In 1942, they were voted the country's No. 1 Box Office Stars by exhibitors. Abbott received the Lifetime Achievement Award for Acting (posthumously) from the Garden State Film Festival in 2006; it was accepted on his behalf by his daughter Vickie Abbott Wheeler. Abbott is a 2009 inductee of the New Jersey Hall of Fame. ^ a b c "Bud Abbott, Straight Man To Lou Costello, Is Dead". The New York Times. April 25, 1974. ^ The year of birth has been reported as 1895, 1896, 1897, and 1898 in different sources. The 1895 date was perpetuated by sources copying from earlier sources. His birth certificate and World War I draft card both use "October 2, 1897". ^ "Bud Abbott". biography.com. Retrieved November 15, 2014. ^ Parish, J.R.; Leonard, W.T. (1979). The funsters. Arlington House. ISBN 9780870004186. Retrieved November 15, 2014. ^ Slide, Anthony. The Encyclopedia of Vaudeville. Westport, Connecticut, Greenwood Press, 1994, p. 1. ^ "Abbott and Foy Team. Late Lou Costello's Partner to Work With Comedian". The New York Times. United Press International. June 11, 1959. 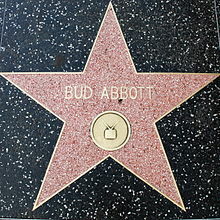 ^ "Hollywood Walk of Fame - Bud Abbott". walkoffame.com. Hollywood Chamber of Commerce. Retrieved November 1, 2017. ^ "Abbott, Bud; and Costello, Lou". Encyclopædia Britannica. I: A-Ak - Bayes (15th ed.). Chicago, Illinois: Encyclopædia Britannica, Inc. 2010. p. 13. ISBN 978-1-59339-837-8. Wikimedia Commons has media related to Bud Abbott.